JONESBORO — Citizens and cyclist will soon be able to access the city easier and get safe exercise for the whole family with the Jonesboro Quality of Life and Connectivity Master Plan bike and pedestrian plan. 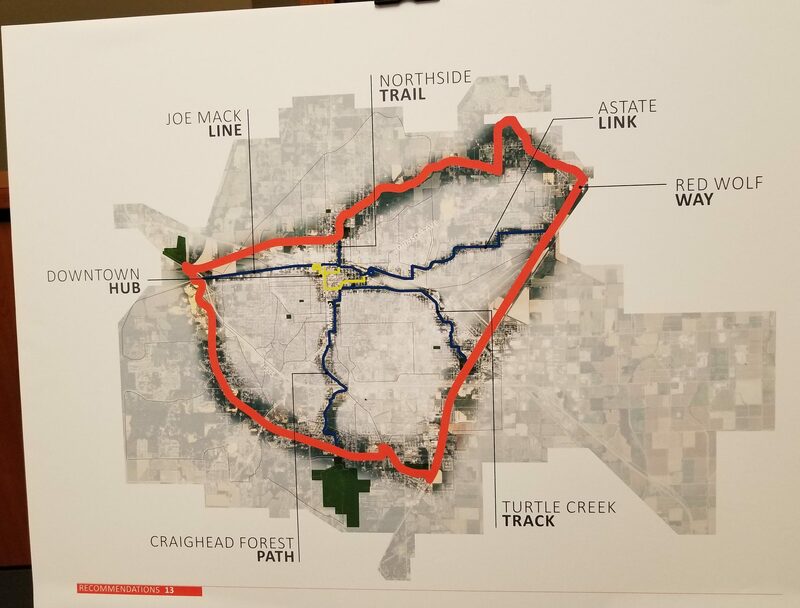 The A-State link is part of the greater biking and walking trail plan proposed by the city with funding coming from grant money. If approved, the grants would be an 80-20% match for a total of $500,000 from the Arkansas Department of Transportation and the Transportation Alternatives Program. The grants would provide $400,000 or 80%, while the city would provide the additional $100,000 or 20%. Arkansas State Vice Chancellor for Marketing and Communications Bill Smith said the proposed plan will strengthen the bond between the university and the Jonesboro community. Not only would the A-State link be helpful for students and employees of the university, but it would also give residents with children a safe and fun place to get exercise on the east side of the city. With the proposed link, citizens would pass through the A-State campus on a path to downtown Jonesboro. Smith said the northeast corner of the city happens to be the only place in Jonesboro without access to a park. The University Heights phase would give citizens and students the opportunity to use active modes of transportation to travel to work or school. Jonesboro Parks and Recreation Director Danny Kapalas said the city would start construction on the University Heights link in late 2020. It will be the first phase of a 68-page master street plan that passed a city council vote. From there, the community selected which phase would be completed first. The impact of the plan will not provide road cyclists much in the way of safe riding. The plan’s design caters to modes of active transportation to citizens. Brent Walker, a local cycling instructor, said it will give people who walk or ride their bike a safe route to travel on. The plan for the University Heights phase will be designed to give citizens safe access along Aggie Road, a notoriously dangerous road with many blind turns and narrow lanes. If approved, Smith said the path would open the entire east side of Jonesboro. The one benefit for road cyclists would be access to gravel and farm riding outside the city limits. Click here to find out more about the proposed link or to read the entire 68-page master road plan proposal.